Recovery mode is one of the must know iOS situations that could be crucial at times when an iPhone, iPad or iPod won't start or gets stuck at apple logo, connect to iTunes, boot loop after iOS update or jailbreak. There is more than one way of putting an iPhone, iPad, or iPod touch into recovery mode, among which RecBoot offers the easiest way to get iPhone, iPad, iPod touch into and out of recovery mode. Moreover, it is a free utility for iOS users to download on Mac & PC. You can download RecBoot (2.2) on Mac directly from http://download.cnet.com or https://recboot.en.softonic.com/; Extract contents from the downloaded Zip file and connect your iPhone, iPad, iPod touch to computer. If you have Windows computer, you can download Recboot for Windows. There are two buttons in RecBoot interface. If the iOS is functioning properly in your device, you can click "Enter Recovery Mode" (the left button) to put iOS device into recovery mode without much effort at all. And if your iPhone is frozen and stuck at recovery mode or apple logo, you can then click "Exit Recovery Mode" (the right button) to kick iPhone out of recovery mode loop. 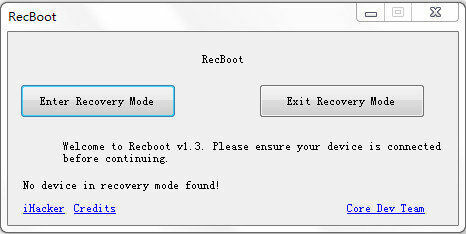 RecBoot is great when entering and exiting recovery mode for iOS device, in the meantime, it contains some limitations which make it hard to satisfy all users in need. RecBoot 2.2 for Mac is not compatible with macOS sierra yet. Not perfectly work on latest iOS 10.2. Won't fix serious iOS system issues, for example, iTunes errors, DFU mode, black screen, blue screen, etc. When putting iPhone into and then out of recovery mode does not fix the issue, you can click Fix All iOS Stuck in Tenorshare ReiBoot to repair the operating system. Click Start to download iOS firmware package and start recovering iOS system back to normal state. The whole process takes about 10 minutes and ensures no data loss. Click here to learn more. Both RecBoot and Tenorshare ReiBoot are free for fixing iPhone, iPad, and iPod recovery mode loop, and both tools have their strengths, so I suggest you keep both tools and try them whenever your iOS device works slowly, or gets stuck.